With tuition hikes likely coming in at around 4 percent for the next academic year, the regent university presidents are still hoping to boost financial aid despite discussions of budget cuts. DES MOINES — For students to continue paying below the advertised “sticker price” for higher education, state support will play a crucial role at Iowa’s universities — particularly as the institutions’ governing board considers a tuition increase of about 4 percent. The institutional heads of the three public universities and special schools governed by the state Board of Regents testified to the House Appropriations Committee Wednesday morning to push for the Legislature to fund their fiscal 2019 appropriations requests. When it comes time to make tough budgetary decisions, Rep. Pat Grassley, R-New Hartford, the House Appropriations Committee chair, said hearing presentations like this helps legislators take the universities’ needs into account. “It’s beginning to come to where it’s almost the Legislature against the Board of Regents, and I don’t think we want to be there,” he said. The Iowa Senate passed a proposal Feb. 8 to take back $14.6 million in appropriations from the universities for their fiscal 2018 budgets. The state House introduced a proposal for $8.1 million in cuts to the regent universities to be split among the University of Iowa and Iowa State University, with no cuts made to the University of Northern Iowa’s budget. Despite this uncertainty, Regent President Mike Richards said the regents are committed to only voting on tuition rates once and have delayed approval of tuition rates for the 2018-19 academic year until June to have a better picture of what the state will provide in appropriations. “Our job is to come up with [a tuition rate increase] that families in the state of Iowa can live with,” Richards said after the committee meeting. The potential 4 percent increase would be lower than the 7.08 percent increase for resident undergraduates that the UI proposed in August at its Tuition Task Force meeting. For fiscal 2019, the universities are seeking an additional $12 million to its base appropriations. In fiscal 2018, the regents received $483.3 million in state support; the UI received $216.8 million of that total. The request would fund resident undergraduate financial aid at the three public institutions — $5 million each for the UI and ISU, and $2 million for UNI. According to the regents’ 2015-16 financial aid report, only 0.3 percent, or $3 million, of all aid comes from the state. Iowa ranks last in the nation for state-awarded need-based financial aid to public university students. To offset tuition increases and the lack of state support specifically for financial aid, the UI has prioritized boosting its institutional financial aid offerings. In 2015-16, the UI allocated $75.4 million to financial aid. Of the undergraduate students who received institutional financial aid, 55.4 percent demonstrated need. At the UI, 45 percent of students graduate without debt. Students leave with an average indebtedness amounting to $26,557, which is roughly the same as the average of all four-year public universities. 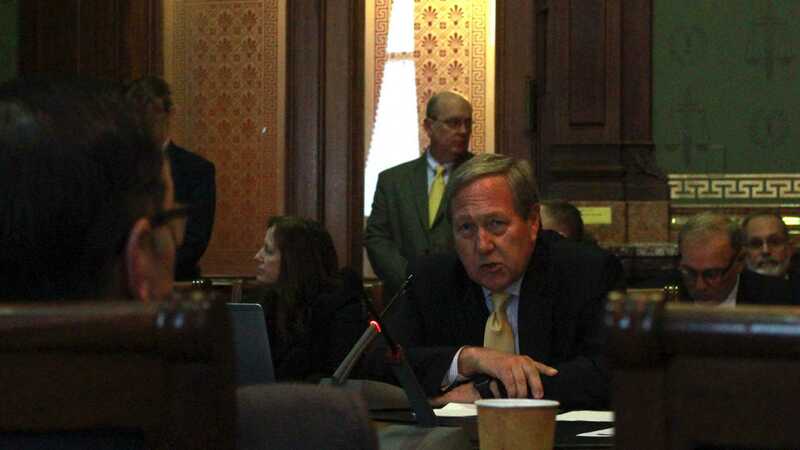 Increasing merit- and need-based aid is the priority, UI President Bruce Harreld told legislators. He detailed the February 2017 decision to cut legacy scholarships, which he said the UI was spending $22 million on. Financial aid needs to be increased proportionally to tuition increases, he said, to ensure the price students pay remains below the actual cost of attendance. To help remain competitive with peer institutions and fund strategic priorities, Harreld said the UI has kept the cost of administrative overhead low at 6.5 percent of its fiscal 2015 expenses, but the state’s role is also critical. “While we at the University of Iowa certainly understand the budget constraints that you all face, it is important to recognize that as the university works to create a stable funding plan, we need the state as a predictable, stable partner as well,” he said. Rep. Cindy Winckler, D-Davenport, a member of the House Appropriations Committee, expressed concern that low-income students were being priced out of higher education as state funding has dwindled, forcing the universities to rely more heavily on tuition revenue as a funding source.